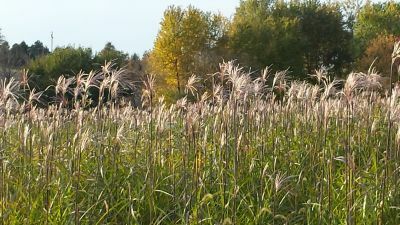 Miscanthus is a highly productive and efficient bioenergy crop gaining popularity in the Midwest United States as a mitigation measure for climate change, energy insecurity, and agricultural pollution. The statewide, sub-field scale field siting tool developed in this work uses GIS data sets to identify specific fields that are highly suitable for miscanthus cultivation based on local field characteristics. In this study, ‘suitability’ is a measure of predicted social, economic and environmental outcomes. The fields identified within 50 miles of each of Iowa’s coal-fired electricity-generating unit can displace 43% of current coal consumption. The energy-based evaluation tool developed in this work estimates the EROI of Iowa miscanthus bioenergy programs between 37 and 59, depending on transportation requirements and chemical field applications. The results suggest that every electricity plant in the state of Iowa can reasonably co-fire miscanthus with other solid fuels, and many could operate exclusively on miscanthus with advancements in densification technology. This transition would reduce carbon emissions and provide a sustainable, in-state fuel source.